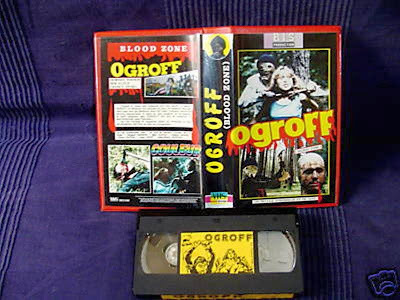 Here's pictures of the three VHS editions of Ogroff, The Mad Mutilator from France. I don't own any of these, and probably never will, as they're extraordinary rare. Being French, they're recorded in SECAM, and tapes in this format seem automatically rare to begin with. The first is from "American Video" and distributed by Clean Productions. Here's the Google Maps address of the distributor from the back cover that's probably long gone now. Seems odd that this flick at any point in history would be disseminated from the most famous stretch of road in all of France. Here's a recent listing on eBay of this tape. Looks like $350(!!!) was too rich for the blood of eBayers. 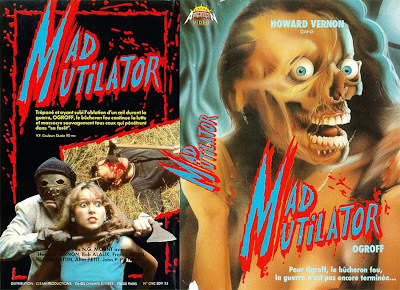 The next two pictured are supposedly self-produced by director Moutier, making them much more scarce than the "American Video" tape, and the first Ogroff home videos produced. I'm unsure which one came first though. The third video, again supposedly, features a prologue explaining the birth of Ogroff. I can't find out whether this is a "new" portion of the film or a segment of Moutier talking about his film. I'm assuming the latter, but apparently the audio is way out of sync. Lastly, there might be a Greek VHS, but I can't find any info on it. 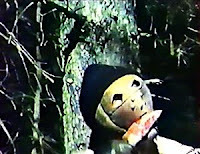 As for DVD-Rs, Midnight Video, Cinema de Bizarre, and Video Screams have copies. I have a Midnight Video copy coming. I found the video file I linked to in my review after I ordered the disc. Though the video is heavily compressed, so hopefully the disc lacks all the block artifacts and the weird "digital" sounding audio. Damn, that American Video cover is awesome. Not $350 awesome, but I totally would have rented it had I seen it as a kid at my local video store (and had it been in France). The last one is cool too, but is an awesomely hilarious way. It looks like a really bad foreign movie poster for Jason Lives or something. I'm not a fan of terror-fantastic aka mchales-navy. He over sells his tapes to such a ridiculous extreme it's hard to take the guy seriously. I mean, every single tape he sells he makes it sound like it's the be all end all of rare VHS tapes. He calls relatively easy to find tapes from TWE and Continental "one of a kind". Really? I know a small fraction of the stuff he sells is beyond rare, but come on man! The majority of collectors that buy from him know better, why try and over-hype something that's gonna sell well anyway and make you look like a complete jackhole? I'll leave the quality of the videos I bought from him in the past for another time.